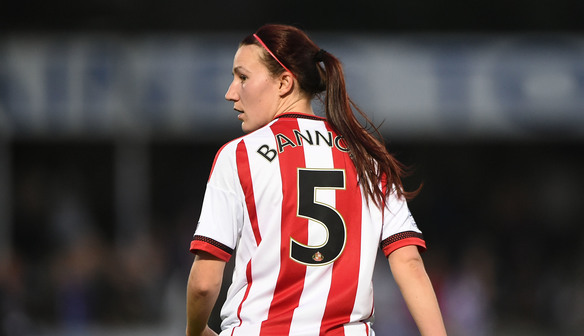 Sunderland captain Stephanie Bannon admitted a few choice words from head coach Carlton Fairweather at half-time had ensured they didn’t finish the game against Reading empty handed. In their first game of the FA Women’s Super League 1 season, the Lady Black Cats trailed at half-time to Lois Roche’s 41st-minute free-kick. But after a stern half-time talk, the hosts produced the perfect response with Beth Mead finding the net within a minute of the restart to earn a point. "The gaffer wasn't very happy with us at half time,” said Bannon. “He said that we needed a bit more grit and determination about us, we needed to make sure that we competed for everything. “He just said that we'd put in a good shift in training and had waited so long for the first game but hadn't turned up. "I thought the conditions were very difficult out there. I think in the first half they dealt with it slightly better than us. “We came out fighting in the second half but the victory wasn't meant to be. "We look to take as many points as we can at home and we were definitely looking to take all three there. We were one nil down and if we look back I think we would take a point. " Sunderland started brightly with Abbey Joice shooting wide and Brooke Chaplen bringing a save from Reading keeper Grace Maloney. But it was Reading who took the lead before half-time when Roche’s free-kick took a deflection off Lucy Staniforth and bounced past Rachael Laws. Sunderland started the second half perfectly though, with Mead rounding Moloney and firing in. Four minutes later, Mead slotted past Moloney but, as the ball bobbled goalwards, Reading captain Kirsty McGee hooked it off the line. Laws then came to Sunderland’s rescue, keeping out a Roche freekick and also denying Ward and Emma Follis. Reading defender Molly Bartrip said: "Having a long trip is not ideal but we are happy with getting a point. The amount of chances we had it should have been three but that's football for you. "The conditions, especially in the warm-up, we were like 'Oh we're definitely up north.' But at the end of the day it was the same for both teams and we got the point that we wanted. Sunderland (4-3-3): Rachael Laws; Abby Holmes, Stephanie Bannon, Victoria Williams, Kylla Sjoman; Rachel Furness, Brooke Chaplen, Lucy Staniforth; Abbey Joice (Keira Ramshaw 46), Beth Mead, Krystle Johnston (Emma Kelly, 46). Subs: Hilde Gunn Olsen, Kelly McDougall, Steph Roche, Megan Beer, Charlotte Potts.